Diary of a Stay at Home Mom: Freezing potatoes! I am sitting down for the first time today, I have been in the kitchen since early this morning, processing pounds and pounds of potatoes. I still have a ton to do, but those will be saved for next weekend because my back is really not happy at the moment. Sometimes you come across a really good deal and I know often we think that even though it is a good price, the food will go bad before we actually get around to eating it all. That is where preparation and freezing comes into play. We live in a time where nothing should be wasted and with a little effort and time, we can make use of what is at our disposal and prepare a lot of items for eating throughout the following weeks and sometimes even months. 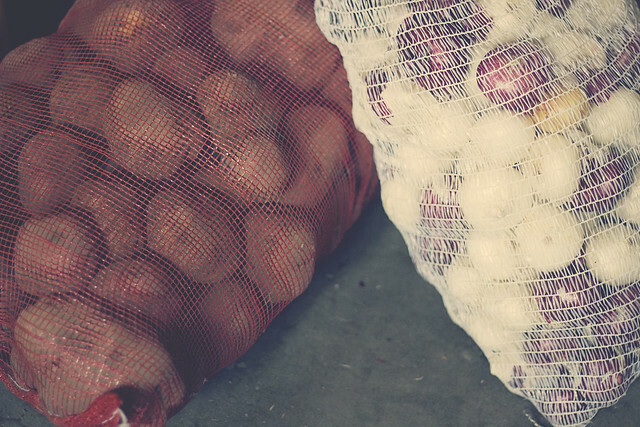 Last week my husband and I picked up 50 pounds of potatoes and some onions too. It was a very good price. I sat down this morning and made a list of what I wanted to freeze, sort of a plan for all these potatoes and onions. I'm not going to tell you that it is easy or not time consuming, because it is, but it is also well worth the effort and time you put in. The trick to freezing potatoes is in either blanching or cooking them slightly, unless you're doing mashed potatoes or baked potatoes. You can't just freeze cut up or whole potatoes because they will go watery and brown and just be plain yucky. It's actually quite a simple process. So let me show you what I did. My family and I love potatoes with the skin on, not to say that I don't peel them sometimes, but a lot of our potato dishes include the skin, besides it is where most of the vitamins and nutrients are kept. 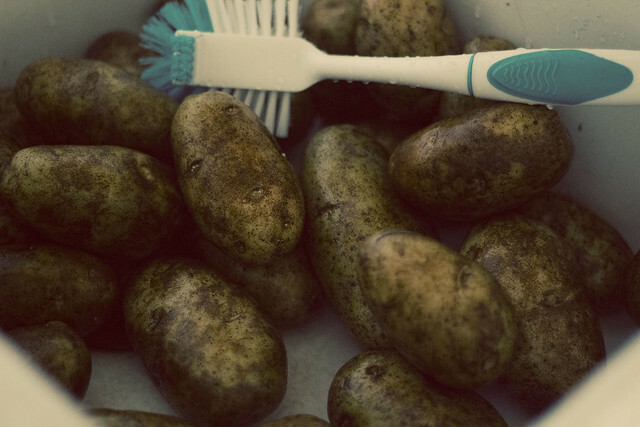 First thing, if you are not going to peel the potatoes, then pop them into the sink and give them a good wash and scrub. Right......let's make some french fries for freezing. Peel and cut them into the size you want. Put them into boiling water and blanch them for about 4 to 5 minutes, plunge into an ice cold bath to stop the cooking. You can also deep frying for about 4 minutes if you want. Place them on a baking sheet in one layer, season according to taste and place in freezer until completely frozen. Transfer to ziploc bags. Cut each into lengthwise wedges then toss with some olive oil. Add seasonings, I did seasoned salt and some garlic with these. 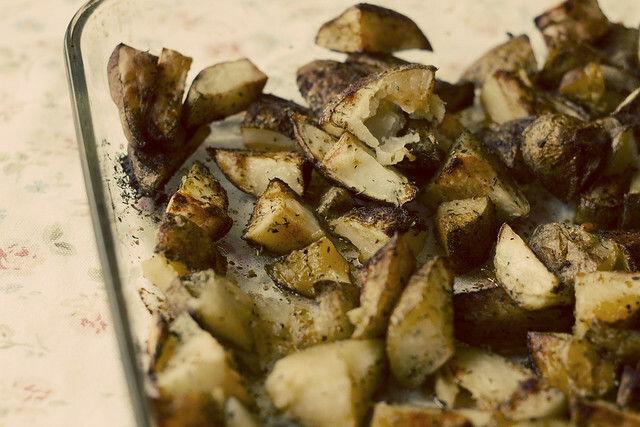 Spray a cookie sheet with non stick spray, or some waxed paper with the spray, add the potatoes in one single layer. Bake at 400 degrees for about 20 minutes. Remove from oven and let cool then flash freeze on a cookie sheet. 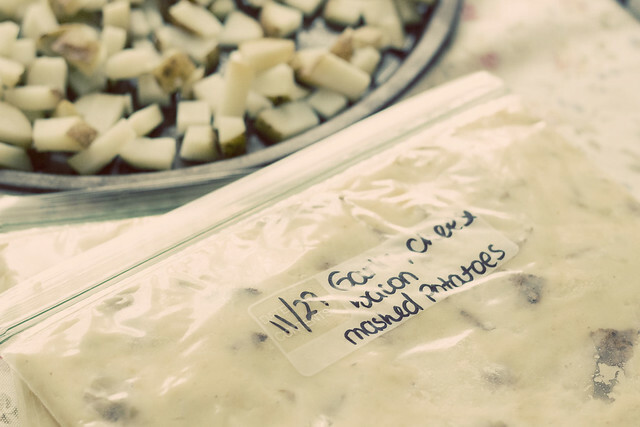 Remove when frozen and place in a ziploc bag. When ready to eat, just bake again at 400 degrees for another 20 minutes. 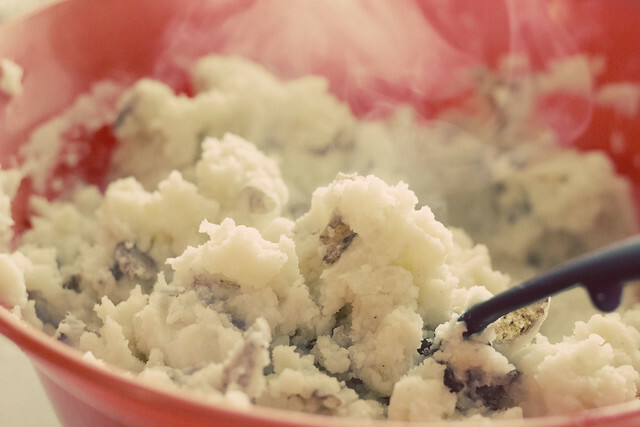 Make your mashed potatoes according to taste. For these I added in cheese and crumbled bacon too. Allow to cool completely, then place in ziploc bags. 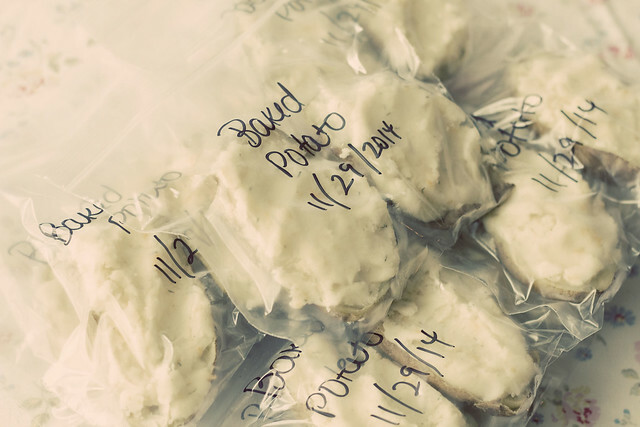 I made two batches and divided the potatoes into the big freezer ziploc bags. I just scoop in there and then use my hand to flatten it out and let all the air out, then close tightly and freeze flat. 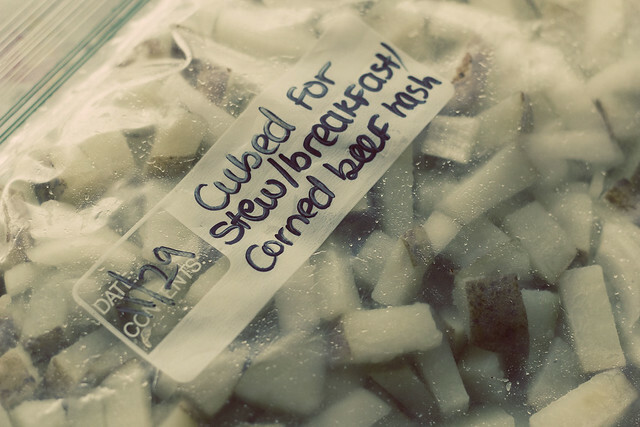 You can also make hashbrowns, but today I decided to go with some cubed potatoes which I can use for a number of things. 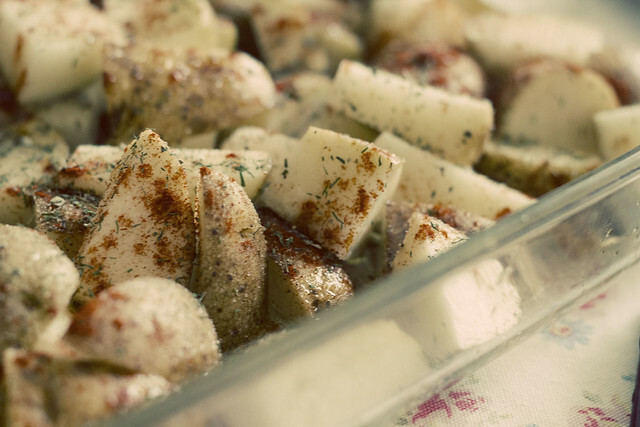 Peel potatoes and cut into small cubes. Put potatoes in boiling water and cook for 5 minutes. Plunge in an ice bath. Drain well. 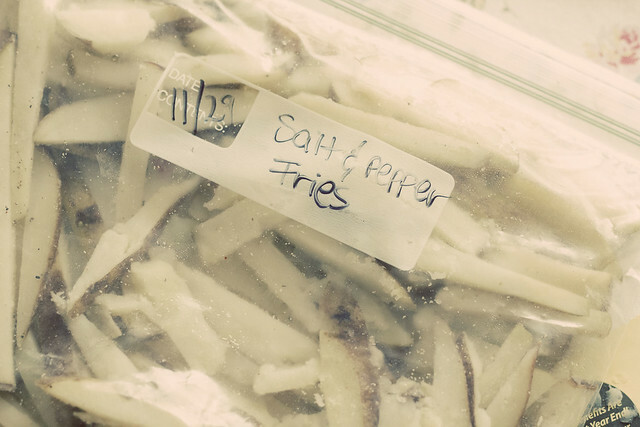 Freeze using the same steps for freezing french fries. I also added in some diced onion to these. 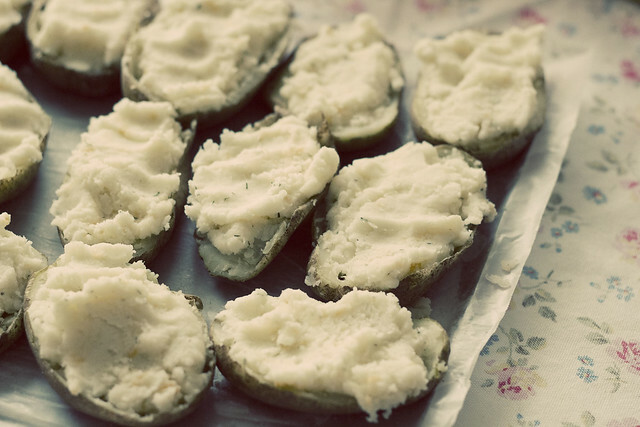 Make your baked potatoes as you usually do. Just remember that for these to freeze, it is better that the potato filling remain much thicker than mashed potatoes. I don't add mayonnaise when I'm freezing them for fear that it will separate and be yucky. I do add a little bit of sour cream and have never had an issue with that, but I know that some people say it goes watery for them, so use your own discretion. 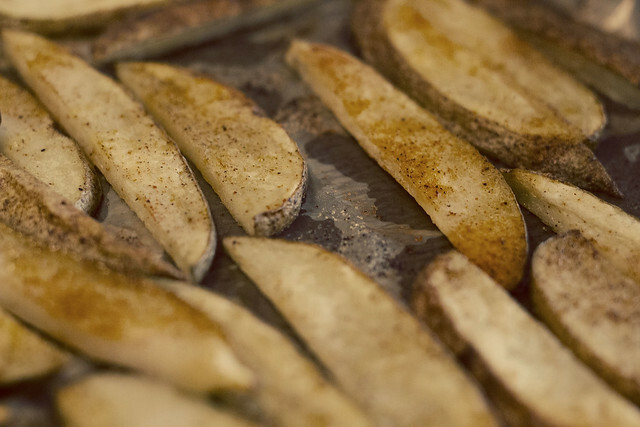 Once the potatoes are done and filled, place them on a baking sheet and freeze them for about 2 hours. 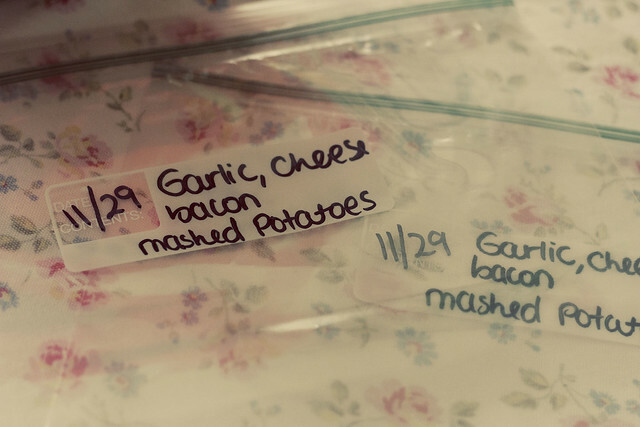 Remove from the freezer and pack into ziploc bags. When ready to eat, bake in a 300 degree oven until warmed through. I cut up the potatoes and tossed them in a baking dish with olive oil, salt and pepper, paprika, garlic powder and some dill. I baked them in the oven for about 20 minutes at 400 degrees. When they were done, I removed from the oven and let them cool completely, placed them on a baking sheet and froze them. If you skip this step they will stick together together. 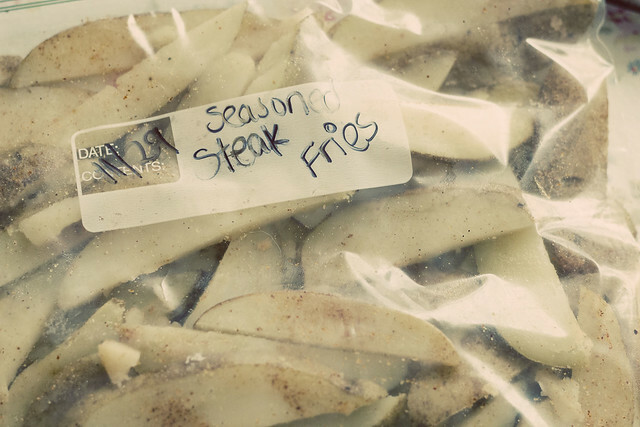 Scoop them into a ziploc bag, label and freeze. When ready to eat, pop them onto a baking sheet lined with foil and sprayed with non stick spray, bake at 425 for about 15 minutes or so. The last thing I made or rather, prepared for the freezer was onions. I had quite a few that were already in my pantry before we even bought the big bag, so wanted to do something with them before they went bad. 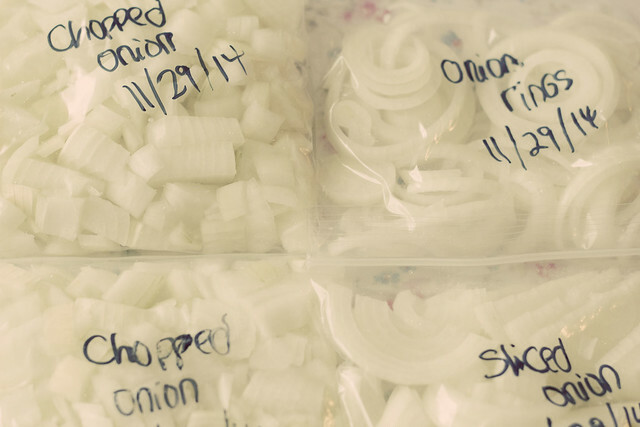 The great thing about onion is that you don't have to pre cook before freezing. I got a few bags of chopped, sliced and onion rings in the freezer. With the rest of the little onions I got in the big bag, I am going to dice some more and then actuallyy pickle some onions, which I love. That will be next weekend's project, along with the rest of the big bag of potatoes. A lot of work, I am knackered right now, but my freezer is filled with ready to go side dishes which will help a lot during the week. I do hope this post will inspire some of you to look into buying in bulk and freezing. When you see a good deal don't be afraid to jump on it, remember that with a little time during the weekend, you can prepare a ton of things to have on hand when you're rushing around trying to make dinner. Thank you for posting. These are great tips! I can see this was a ton of work, but how wonderful to have them all in your freezer, ready to go - and saving money! It's raining here too :) Lovely night to read or watch a movie. Thanks for the freezing advice, I don't usually freeze potatoes but I'll certainly give them a try after reading your post. Have a nice Sunday! Thanks for these tips and recipes. Happy holidays filled with love, joy and peace. One year I cubed and froze them for hashbrowns. It worked great for taking camping. They would stay frozen in the cooler until we took them out for breakfast. Wow - you weren't kidding when you said you were up to your ears in potatoes! Lol! Wonderful ideas and tips for utilizing such a great deal and having it work for you for a long time to come. You will have dreams of potatoes!